​​For the last few teams we have been working on geometry. 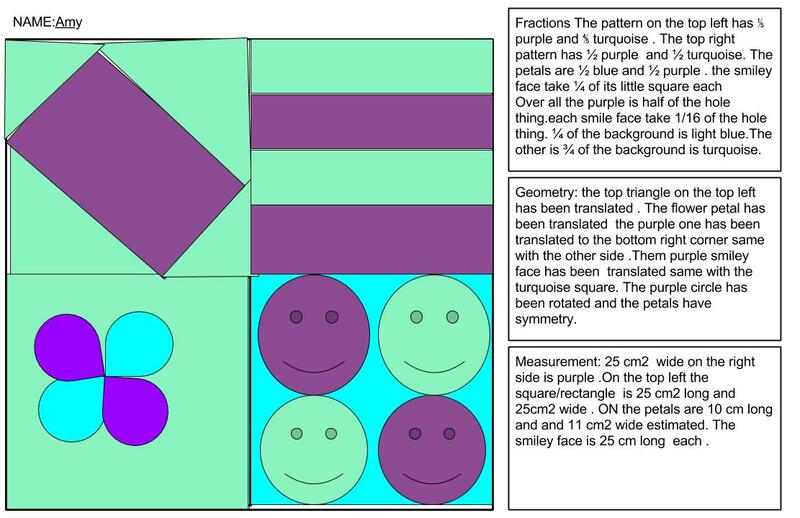 We have improved your skill on translating and rotating using your body's.Today we finally applied our skills by creating a stain glass window.We have built our knowledge on translation and rotation and our measurement and fractions then we made meaning and then we applied our knowledge on this stained glass window by justifying our design. I love this art and all that went with the lovely picture. I also think that that maths goes with the picture. I love the great use of the smiley faces and the petals I give the page a creative feel.